LearningExpress Library offers online tutorials, practice tests and eBooks aimed at people who want to improve their test-taking and workplace skills. Self-paced e-courses for improving skills with Microsoft Word and Excel, social networking as part of the job search, and professional writing for cover letters and on-the-job reports. Practice tests for the GED, SAT, and GRE, plus a variety of occupational assessments. There are even resources for children and young adults preparing for standardized testing! eBooks that focus on career-ready basics, including managing personal finances, public speaking and statistics. Patrons create a free account to access and save resources to their profile. 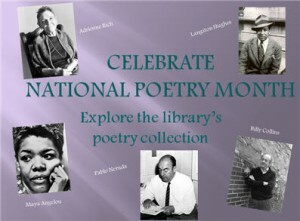 The library is featuring a display on the lower level of poetry books. Check out classic poets or modern poets! Be inspired to write your own poetry. Here are some great websites for reading, learning about, and listening to poetry! A resource from the Academy of American Poets with thousands of poems, essays, biographies, weekly features, and poems for every occasion. Library of Congress poetry resources including poems, poetry readings, poetry news and events, and information about U.S. poet laureates. The Poetry Archive is an ever expanding archive of poets reading their own work.